We deal with the problem of a center sending a message to a group of users such that some subset of the users is considered revoked and should not be able to obtain the content of the message. We concentrate on the stateless receiver case, where the users do not (necessarily) update their state from session to session. We present a framework called the Subset-Cover framework, which abstracts a variety of revocation schemes including some previously known ones. We provide sufficient conditions that guarantees the security of a revocation algorithm in this class. We describe two explicit Subset-Cover revocation algorithms; these algorithms are very flexible and work for any number of revoked users. The schemes require storage at the receiver of log N and 1/2 log2 N keys respectively (N is the total number of users), and in order to revoke r users the required message lengths are of r log N and 2r keys respectively. We also provide a general traitor tracing mechanism that can be integrated with any Subset-Cover revocation scheme that satisfies a “bifurcation property”. This mechanism does not need an a priori bound on the number of traitors and does not expand the message length by much compared to the revocation of the same set of traitors. The main improvements of these methods over previously suggested methods, when adopted to the stateless scenario, are: (1) reducing the message length to O(r) regardless of the coalition size while maintaining a single decryption at the user’s end (2) provide a seamless integration between the revocation and tracing so that the tracing mechanisms does not require any change to the revocation algorithm. Work done while the author was visiting IBM Almaden Research Center and Stanford University. Partially supported by DARPA contract F30602-99-1-0530. 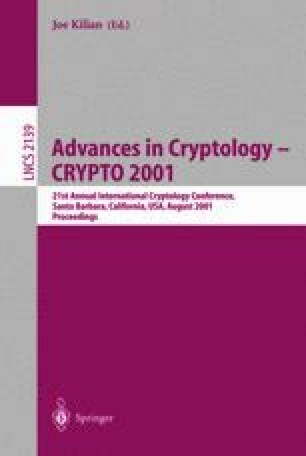 D. Naor, M. Naor, J. Lotspiech, Revocation and Tracing Schemes for Stateless Receivers, full version available at the IACR Crypto Archive http://eprint.iacr.org/.